Paying Cash For Drugs May Be Cheaper For Seniors : Shots - Health News Sometimes a drug plan's copay is higher than the cash price, but insurance rules keep pharmacists from telling Medicare beneficiaries unless they ask. Many Medicare patients don't realize they can sometimes pay less out of pocket for a prescription drug if they pay cash, instead of the insurance copay. 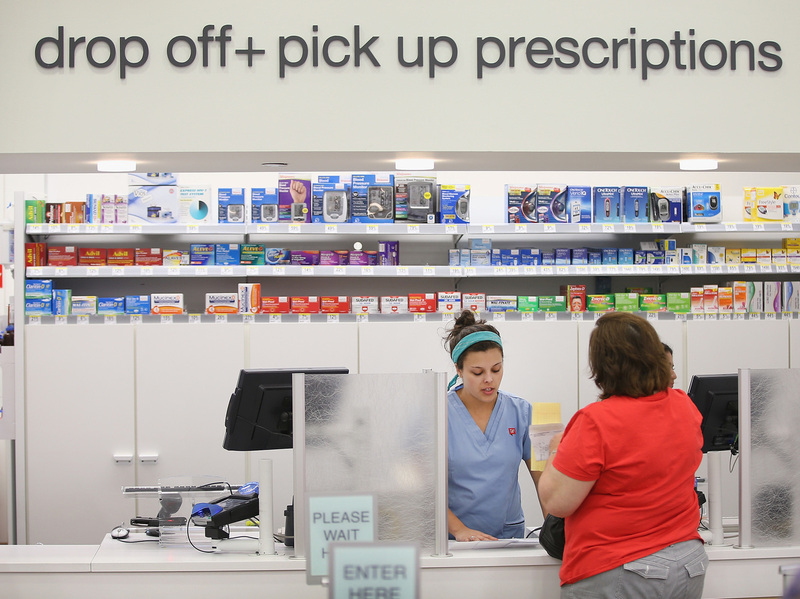 A simple question at the pharmacy could unlock savings for millions of Medicare beneficiaries. Under a little-known Medicare rule, they can pay a lower cash price for prescriptions instead of using their insurance and doling out the amount the policy requires. But only if they ask. That is because pharmacists say their contracts with drug plans often contain "gag orders" forbidding them from volunteering this information. As part of President Trump's blueprint to bring down prescription drug costs, Medicare officials warned in a May 17 letter that gag orders are "unacceptable and contrary" to the government's effort to promote price transparency. But the agency stopped short of requiring insurers to lift such restrictions on pharmacists. That doesn't mean people with Medicare drug coverage are destined to overpay for prescriptions. They can get the lower price, when it's available, simply by asking, says Julie Carter, federal policy associate at the Medicare Rights Center, a patient advocacy group. "If they bring it up, then we can inform them of those prices," says Nick Newman, a pharmacist and the manager at Essentra Pharmacy in rural Marengo, Ohio. "It's a moral dilemma for the pharmacist, knowing what would be best for the patient but not being able to help them and hoping they will ask you about the comparison." For consumers inclined to price-shop, details may be hard to find: Medicare's website and annual handbook don't mention it. "If you don't know that there are a bunch of different prices that could be available at any given pharmacy, you don't know what you don't know," says Leigh Purvis, the AARP Public Policy Institute's director of health services research. Researchers analyzing 9.5 million Part D prescription claims reported in a research letter to Journal of the American Medical Association in March that a patient's copayment was higher than the cash price for nearly one in four drugs purchased in 2013. For 12 of the 20 most commonly prescribed drugs, patients overpaid by more than 33 percent. Although the study found that the average overpayment for a single prescription was relatively small, Newman says he has seen consumers pay as much as $30 more than the cash price. Daniel Nam, executive director of federal programs at America's Health Insurance Plans, a trade group, agrees that "patients should have access to the lowest price possible at the pharmacy." But, he says, Medicare's warning takes aim at an increasingly rare occurrence. Gag order clauses are "not something they are incorporating into their contracts," he says. UnitedHealthcare, whose popular prescription drug plans dominate the market, does not include such clauses in any of its Medicare, Medicaid or commercial insurance contracts, says Matt Burns, a company spokesman. Pharmacy benefit managers also say gag orders are not typical. "If it is happening, it is very much an outlier," says Mark Merritt, president and CEO of the Pharmaceutical Care Management Association. Some pharmacists disagree. Kala Shankle, policy and regulatory affairs director for the National Community Pharmacists Association, which represents 22,000 independent pharmacies, says insurers have punished pharmacists who violate gag orders by dropping them from the plan's network. In Ohio, one of several states that have banned gag orders in insurance contracts, including some Medicare drug plans, officials responded to complaints about the problem. "The Department has received inquiries related to entities withholding cost-saving information from consumers, which sometimes results in an insured paying more for pharmacy benefits than the actual cost of such pharmacy benefits," the Ohio Department of Insurance wrote last month. Illinois and Ohio state legislators are considering bills making these restrictions illegal, and similar legislation has been introduced in the U.S. Senate. "If we didn't have these gag clauses, there would not be a need for the legislation and policy changes movement that's going on in the country," says Garth Reynolds, executive director of the Illinois Pharmacists Association.